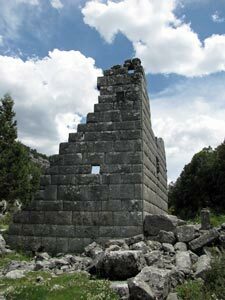 "Paul and Barnabas left Perga and arrived in Antioch, a city near Pisidia. On the day of worship they went into the synagogue and sat down". Acts 13 v 14. This one sentence is all that the bible has to say of the apostle Paul's travels from Perga to Antioch, preferring to dwell on events after he arrived there. His trip was part of his first missionary journey in 47-48 AD, from Antioch in Syria to Cyprus and the regions of Pamphylia and Pisidia in Asia Minor. 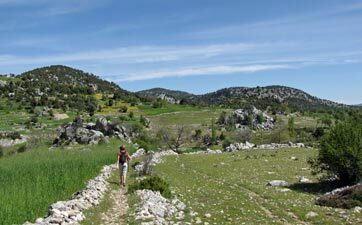 While no details are given, it would have been no mean feat to cross the wilds of the Taurus Mountains in those long ago times, even with the odd Roman road to walk on. 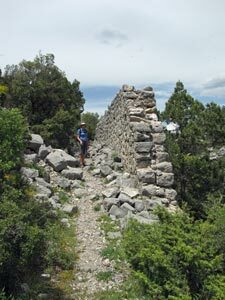 Two millenia later, Kate Clow and a band of hardy volunteers developed Turkey's second major long distance walking trail, between the ruins of the ancient cities of Perge and Antioch, and named it the St Paul Trail. 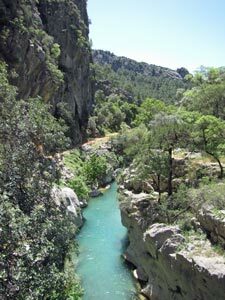 While St Paul's exact route is unclear, this trail passes through the same wild country of rugged mountains, canyons, lakes and the ruins of ancient civilisations. The St Paul Trail is a curious one, with two beginnings and one end. 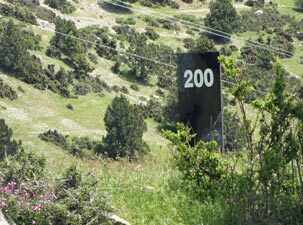 It was opened in 2004, but is still evolving, with new sections and other variants that we did waymarked as late as 2010. 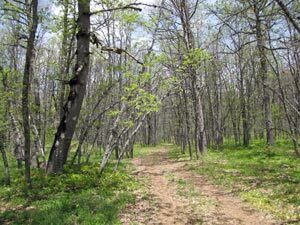 The trail is almost 500km long and would take several weeks to walk from end to end. Coming from the Antipodes for only 8 weeks, with a desire to sample as much of Turkey's diversity as we could, this was not an option for the fair Nello and myself. Using Kate's guide book as our reference, we chose to do a series of day-walks in the central part of the trail near where the two starting trails merge into one. 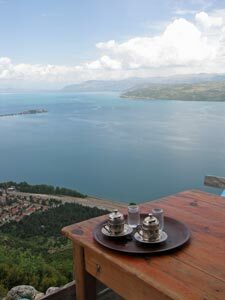 We based ourselves first at the mountain village of Sütçüler and then at the lakeside town of Eğirdir. 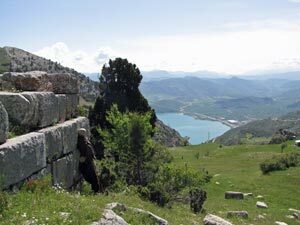 With its canyons and lakes, I supect this region best encapsulates the landscapes of ancient Pisidia. So join us as we follow the footsteps of St Paul in this beautiful part of Turkey - at the end of our walking, I'm sure we will want to sit down, though I doubt it will be in a synagogue. After a morning enjoying the charms of Kaleiçi, the old centre of Antalya, and its magnificent setting with rugged mountains, still streaked with snow, rising out of the deep blue of the Mediterranean, we were picked up by Devrim from Mithra Tours and headed off to Sütçüler, across the fertile coastal plain and on into increasingly rugged mountains. 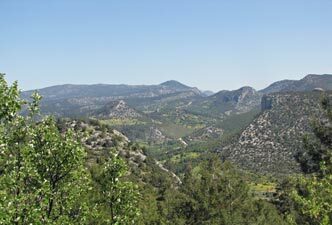 This small town lies perched on a steep slope looking across to rocky pine-clad mountains cut deeply by gorges. From our room in the Hotel Karacan, our base for the next four nights, I am looking out onto one of the best "views from my hotel window" that I have seen. Tomorrow, our exploration of this marvellous landscape begins. 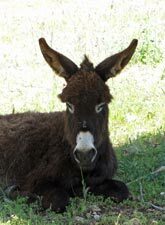 Our hosts at the Hotel Karacan, drove us out along the narrow and winding road through the mountains from Sütçüler to the hamlet of Gümü, the start of our first walk in Turkey. The owner, Ibrahim, had way-marked this walk himself and has done a lot of trail-blazing in the region to open up new areas for visiting walkers. This is his walk. Farewells made, we found ourselves standing alone in front of the tiny mosque of Gümü at the start of our walk back to Sütçüler. The sight of an old village woman feeding a goat set the tone for the day, a glimpse into the daily lives of villagers in this isolated region. 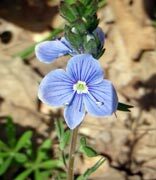 We headed westwards on the road out of town, but quickly the first blue and red waymark directed us up a narrow shady hedgerow, that took us past small plots of wheat growing on the hill slopes. Looking across the wheat fields, a broad vista of rugged mountains opened up to the west. The hedgerow led out onto a gravel road, which we followed as it climbed higher. 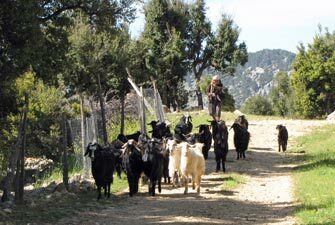 Passing a flock of goats being herded back to the village, we again left the road to pass between a rocky knob and bright green wheat fields spilling over a hillside gridded with dry stone walls. 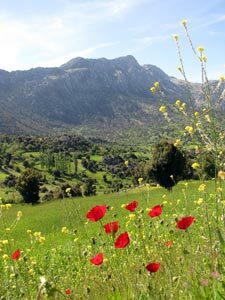 The track was lined with wildflowers of many colours and shapes, the birds were singing, the sun shone brightly and a cooling breeze wafted by – what a great start to walking in Turkey! 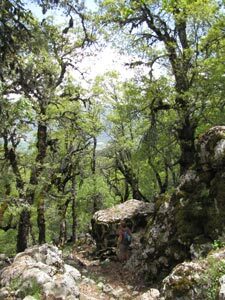 We skirted one end of the long village of Sarimehmetler to pick up a rocky track, lined with low stone walls, that took us gently if somewhat unevenly down to a creek. An even rockier track took us back up to a gravel road. We were feeling good and headed along the road to the village, as was suggested by our somewhat brief track notes, only to realise that it had been a long way since we had seen a red and blue waymark. Mild panic set in with the realisation that our Turkish language skills were non-existent, but with the help of a picture of the waymarks and a bit of quick name writing, some of the villagers directed us back to the track and we were on our way again. 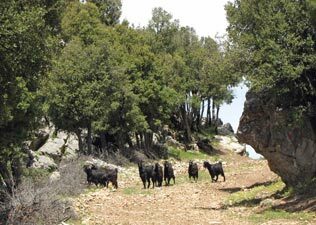 The refound track led us out of the farming land to cross a saddle and into the forest of scrubby oak and juniper that line the northern slopes of the mountains here. 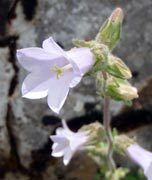 Grand views opened up to the north to distant snow-streaked heights and the wild flowers lining the tracks changed. 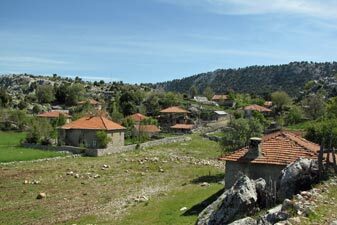 Below we could see the houses of the village of Karapinar and thought of lunch. We has planned for lunch at Ahmet’s place in Karapinar and our thoughts were turning to food when two figures on the slope way below waved to us. We waved back and kept walking, only to see one of them, a young Turkish girl, hurry after us calling out. 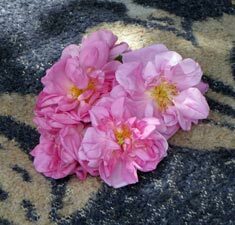 Language gaps apart, we realised that she wanted us to come with her down the slope, where we found Ahmet in the shade of an oak – picnic rug laid out, fire stoked up, meat on the grill and a bouquet of sweet-scented Isparta roses for the fair Nello. 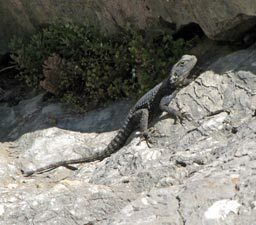 He and his daughter had climbed the slope and were waiting for us with goat meat on the fire, fresh greens, wafer-thin flat bread and freshly brewed tea for lunch. What a pleasant surprise – we spent in enjoyable hour learning how much you can find out about other people with absolutely no common language. 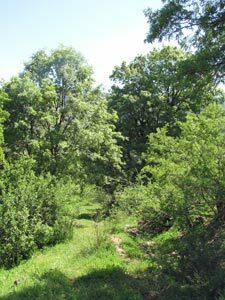 Time was passing, so we climbed back up to the path, which was actually the rocky remnants of an old Roman Road, as it traversed the oak-covered slope, before winding its way down the flanks of Mt Merevet. 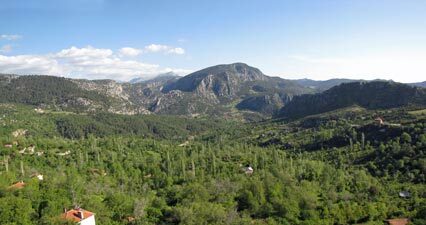 Below we could see the mouth of the Değirmen Canyon and beyond it the town of Sütçüler spread out across the far slopes. Our destination was in sight. The road dropped down into some more open grassland and began to descend steeply on a rutted surface. Feeling more confident with our directions again, we left this unpleasant walking surface to take a shortcut, directly down a goat track in the pasture that took us to a fast flowing canal. We followed the canal, picking up the waymarks again as we did to join the main gravel road. 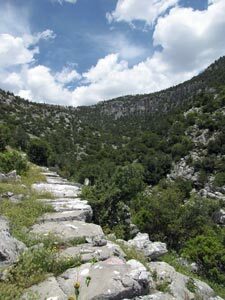 We had now dropped well below the heights of Sütçüler and found ourselves deep in the Değirmen Valley beneath it. Ibrahim’s trail markers then directed us off the road and onto a small scrub-lined footpath alongside the babbling waters of a stream that flowed out of the mouth of the Yesildere Canyon. 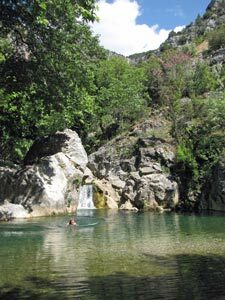 Soon we were following it beneath a shady canopy of trees until it brought us to a beautiful clear green waterhole, fed by a small waterfall – a beautiful spot to stop for a while and cool ourselves down with a swim. Cool was an understatement – the waters were icy, but so refreshing. 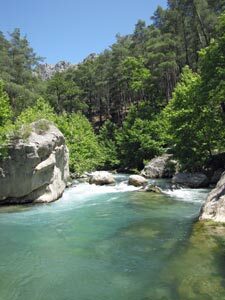 It was hard to drag ourselves away from the pool, but time was passing, so we headed back on the opposite bank, passing a bridge and picnic area to commence the final climb back up to Sütçüler. 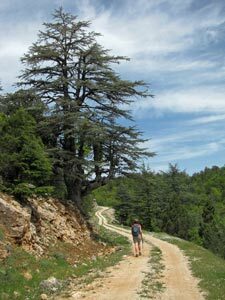 First, a track up to a resin-scented pine forest, than following the course of a stream, criss-crossing it three times to finally climb steeply up to the outskirts of the village. 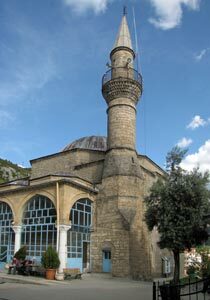 As we climbed, the call of the muezzin echoed across the valley from the minaret of the Sütçüler mosque - there was no doubt that we were trekking in Turkey. The afternoon sun was now beating down and in the lee of the breeze, we were soon hot and sweaty again. The last bit of the walk was up through the steep laneways of the village to eventually reach the square for a quick refreshment stop to the quiet amusement of the old men gathered there. 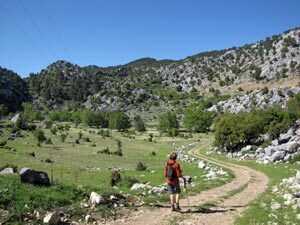 The concept of walking for pleasure has not yet reached rural Turkey, especially when foreigners roll up looking as hot and sweaty as we did. The hotel and end of our walk was only a few hundred metres higher up, so we pushed on and toasted the completion of our first walk with an ice cold Efes beer. There is something unique about the landscapes of Pisidia. Our first walk had been a great one and left us looking forward to more. Thanks Ibrahim, for all the work you did in setting up this track. 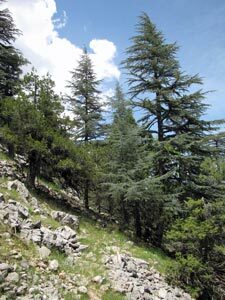 Our second walk in this region was a shorter one, but cranked up considerably in degree of difficulty – we were going to descend into the Yazili Canyon. It was another glorious blue-sky day, as we set off with Huseyn, our cook / philosopher / humourist, after another of his filling breakfasts. After a short car trip, he dropped us at the junction of a road leading to Çuruk. 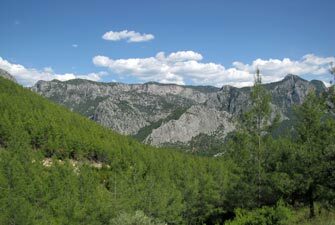 We headed off along the gravel road, beneath the shade of tall pines, with views opening out to the north of the winding depths of the Değirmen Canyon and back over its opening to Sütçüler. It was a pleasant stroll and soon we were picking up the red and white waymarks of the St Paul Trail. 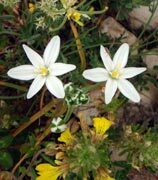 Cresting a small rise, the road led us down into a grassy bowl beneath the long rocky ridge of Erdiasum Tepe – an old house and signs of fenced plots told us that we had reached the locality of Çuruk – I say locality because it didn’t appear that anyone lived here anymore. 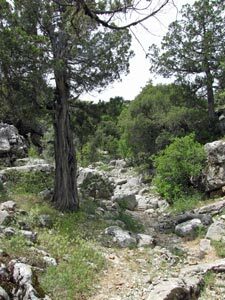 The road petered out and we followed a track along the bed of a dry stony creek towards the point where the rocky ridge of Erdiasum Tepe plunged into the canyon. Our path ahead was becoming more obvious, a narrow and steep gap up onto the ridge. We followed the red-white waymarks up it to crest the ridge at a point where a rib of jumbled boulders spilled down from its summit. 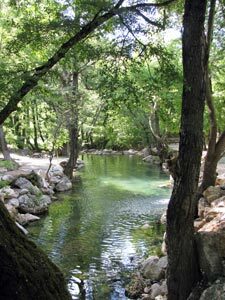 After a quick rest in the shade of an oak tree, we left our packs and picked our way up the sharply eroded boulders of the rock rib, its nooks and crannies filled with the spiky leaves of holly. 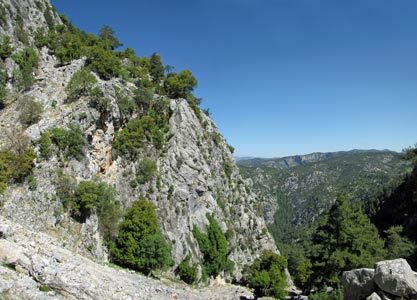 From the top, a glorious view of distant Lake Karacaören spread out to the south, while to the north you could look down into the junction of the Yazili, Değirmen and Bagirsak Canyons. 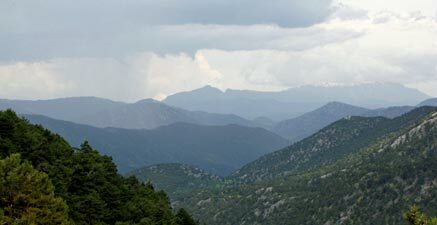 Beyond these, on the horizon, lay the snow-tipped ridge of 2635m Davras Dağ. It was a detour well worth making and marked the highest point of our walk. 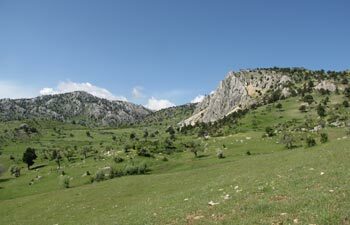 From here it was almost all downhill, 750m into the depths of Yazili Canyon. 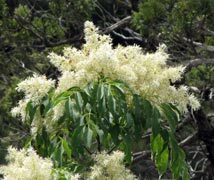 From the rock rib, we descended to a small plateau of jumbled boulders, dotted with scrubby oaks and shrubs. There was no path as such through this maze, but the route had been freshly cleared and re-waymarked and our red and white guides led us safely across to the sheer rock walls of its western edge. Suddenly, a steep shute opened up before us and the track dropped rapidly down in a series of very tight zigzags. 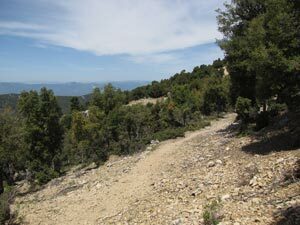 Again, recent track clearing and upgrading made the descent easier and safer. This maintenance had been done by group of young volunteers, so if any of you read this we just want to let you know that your work is appreciated. The views on this descent of the sheer rock walls, pine and juniper covered slopes, canyon depths and distant lake were superb. 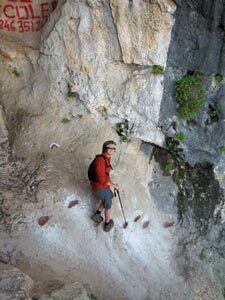 After a couple of tight squeezes, having to enter a shallow cave to get by one rock face and scramble over a sharp outcrop to get around another, our rapid descent became a gentler downward traverse, mostly in the welcome shade of the rock face above. 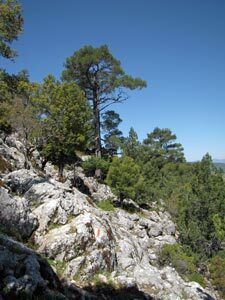 The route soon turned steeply down again, this time on a steep slope covered in pines. 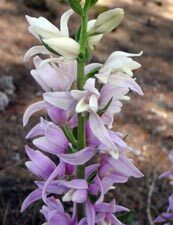 It was great to be in the resin-scented shade of these trees, dried needles crunching underfoot and clusters of beautiful pink orchids scattered amongst them on the forest floor. The only downside was that the slope was mainly loose scree, so it was a matter of lengthening walking poles and shortening our stride as we picked our way carefully down. Soon we could hear the sound of rushing water rising up from below. The canyon floor was close as we reached a well-formed track, which led us the final few metres of descent to a road running along the floor of the canyon. Below us the clear green waters of the Göksu River rushed downwards in a series of rapids and cascades towards the mouth of the canyon. After a quick visit to the river, we climbed back up to the road and followed it southwards. 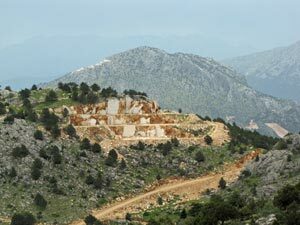 It was in fact part of The King's Road, built in the 5th century BC between Ephesus and Babylon. 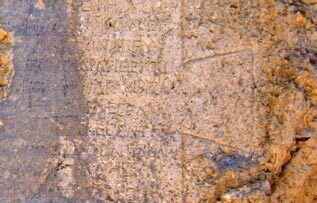 The rock face on the edge of the road was carved with the occasional Greek inscription and even an inspirational poem by the 1st century AD philosopher, Epictetus (see box). History is never far away in this part of the world. And by them is a man exalted, not by the error of his ways. We continued down the road to reach a narrow point of the gorge, where a small bridge took us across the river. A little further on, we reached a picnic area on the west bank. Our walk was over, as this was the pick-up point for our return to our hotel in Sütçüler. 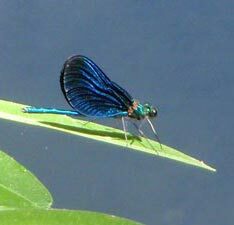 Still, there was plenty of time for lunch beneath the shady plane trees and a swim in a fast-flowing reach of the river. The water was as icy as yesterday, but it was also as refreshing. 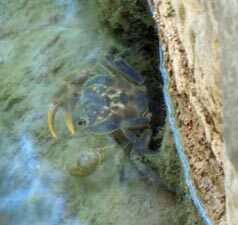 Sitting in the warm Pisidian sunshine, watching the metallic blue dragonflies flitting above the water's surface and the occasional freshwater crab scurrying beneath it – what a great way to finish our descent into Yazili Canyon. As in many riverine locations in this area, there was a small fish farm at the picnic area full of plump trout. Several of them decided to accompany us home to Sütçüler and join us for dinner, beautifully cooked by Ibrahim .... delicious!!! 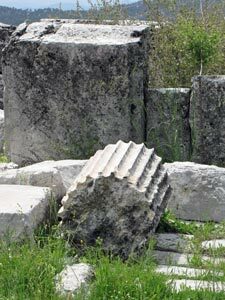 The ancient city of Adada was founded prior to the 2nd century BC and for many years was an independent city. 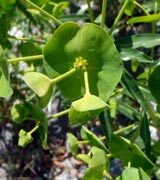 It flourished under Roman rule in the first few centuries and was abandoned sometime between the 9th and 13th centuries. Its structures decayed and remained hidden until 1841, when the ruins were rediscovered. As a major city between Perga and Antioch, St Paul probably passed through it and the modern St Paul Trail certainly does. 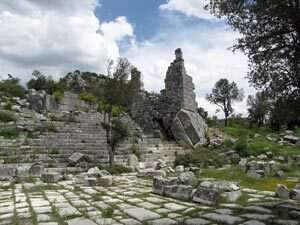 Today, our walk would take us from Sütçüler to the ruins of ancient Adada. 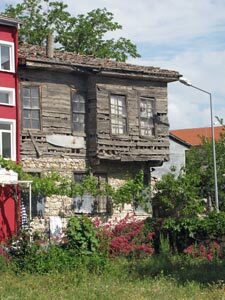 The clear blue morning skies were becoming the norm as, for the first time, we set off on foot from our hotel in Sütçüler. Our guide notes said that we would follow the asphalt road out of town for 500m before turning off it. It turned out to be almost 2km of steady climbing – fortunately the waypoint on my GPS gave us confidence that we were on the track, but for anyone without a GPS, I am sure that the worry-meter would be reaching dangerous levels over the last section along the main road. Some changes are needed to the guide notes here. Another refreshingly cold spring Leaving the asphalt, we headed north along a gravel road that led us through the green countryside around the base of the low Karaburun Mountains and over our first pass for the day. Ahead lay a broad green valley dotted with the red tile rooves typical of houses in this region. The route that we were taking was a new one that had only been way-marked in 2010. The St Paul Trail is a new trail and, to some extent, is still evolving. 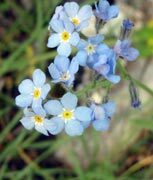 After a few kilometres of asphalt and dirt road, we were starting to wonder whether it was evolving in the right direction, but then we turned off the road and followed a grassy track down through forest and across flower-filled meadows. 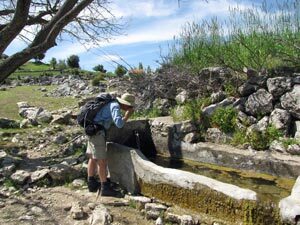 Stopping a couple of times to refresh ourselves with cold clear water from the springs bubbling out of the hillside behind us, we began to appreciate its virtues. 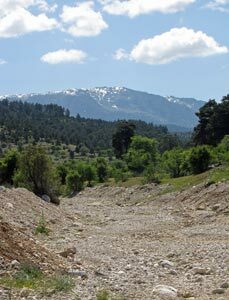 Soon we crossed the stony bed of a dry creek, that directed our gaze up to the snowy heights of distant Sarp Dağ. After the creek, the track led us up to another asphalt road, which we followed briefly before continuing our northward push on a small road leading up to the hamlet of Poslar. 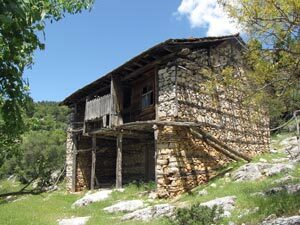 High behind the hamlet lay a steep pass, with a couple of abandoned traditional houses. 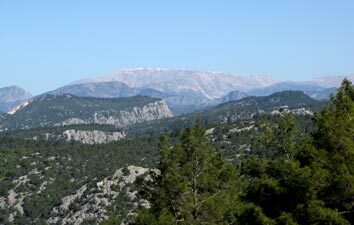 The road changed to a track, which led us up and behind them to reach the pass, opening up views down to our second valley of the morning, narrower and backed by pine covered hills. 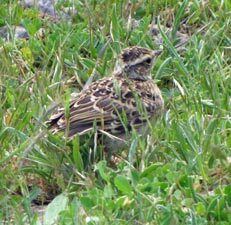 The route down into the valley started out as a pathless traverse of rocky, scrub covered grasslands, marked only by red-white waymarks on the rocks – fine, apart from the fact the dense spring grass cover was attempting to hide them from us. It was a case of spot the marker, walk to it, stop to find the next one, walk to it, stop etc etc …. a slow process. 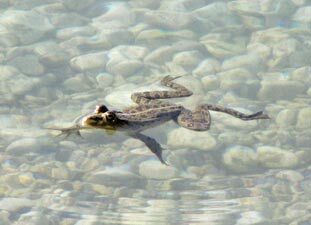 For a while, a clear path emerged which led us down alongside a barbed-wire fence, but then we had to leave it to cross a stream and the game of find the way-mark was repeated. A wheat field planted across the route did not help, but we eventually picked our way through the grassy maze to join the track that led up to our third pass of the day. The midday sun was hot and so was the climb, so we declared it lunchtime when we crested the pass and found some shade and a bit of breeze from where to admire the views of the broad valley and distant village of Sağrak beyond. Now where is that marker stone? Lunch over, we started the descent into our third valley, firstly on a well-marked track, but soon the way-marks obliged us to drop down through the open meadows for another game of “find the route” in the long grass. We succeeded with the help of my GPS which guided us to a waypoint marking the merging of this new variant with the old route to Adada. 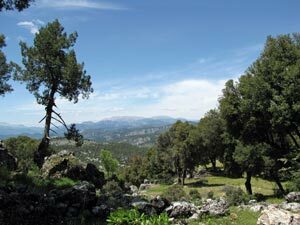 We were now following the low-walled course of the old Roman road, passing massive old pines scattered in the fields. 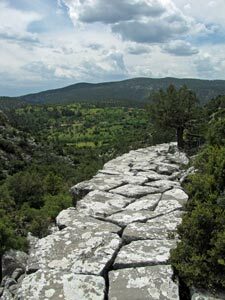 The road headed towards a rocky amphitheatre cut deeply into the rugged hills ahead and soon we were winding our way up into it through a low juniper scrub. Climbing up and onto a rocky ledge, we looked ahead to realise that we had just stepped back on to the old Roman road, this time marked by a long line of massive flat rocks, sometimes even, sometimes slipping away, but curving gently around and up the slope into the heart of the amphitheatre. 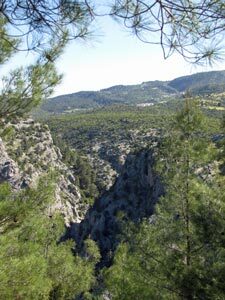 The road turned to the left to a reveal a narrow dry and rocky gully, almost hidden beneath the scrubby junipers and oaks. 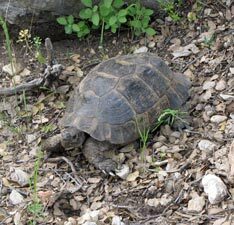 The road stopped and we continued up the creek bed, following a line of small brown-stone cairns. A broken rounded column in a jumble of rock told us that we were near and then ahead, we saw a stone wall with archway half-hidden in the scrub. We had arrived at Adada, where little remains of its past glories. Passing remnants of the city wall, we reached the agora, a paved central square once surrounded by shops, but now left with a jumble of broken columns and rows of stone seats from where people once watched performances in the square. 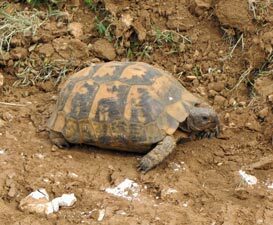 The only performance that we saw was a fairly risqué display by two tortoises. 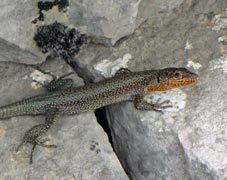 Did you know that they make a noise like a cat mewing when they mate? 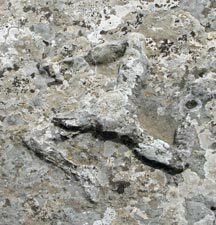 On one fallen block, we notice a carved Triskeles, a symbol used by the ancient Adadans. Is it just a coincidence that the the centre of three arms of the St Paul Trail also lies here in Adada? Our lift back to Sütçüler arrived before I could finish my musings on the strange ways that history can repeat itself. And thus ended our journey on the road to Adada. The next morning was a time for farewells, as we were leaving Sütçüler for a new base on the shores of Lake Eğirdir. So after goodbyes to Ibrahim and family, Huseyn, our cook / translator / philosopher and quick-wit, the group of English walkers and Karl from Bavaria, who was exploring the St Paul Trail on his own, we were on our way. Thanks to all of you for your good company and humour. Ibrahim dropped us at the junction of the access road leading up to Kasnak Forest before taking our bags on to our accommodation in Eğirdir. The guide-notes that we had been given said that we would then walk there along a new section of the St Paul Trail, waymarked less than a year ago. However, there were no distances or times provided, so this was taken on faith and, as later turned out, proved not possible. 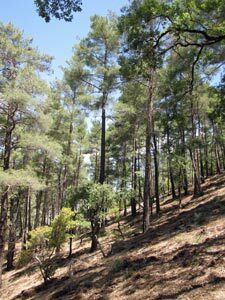 We set out under the usual blue morning skies, walking up a gravel road amongst the pine trees, before leaving it to climb steeply up a wooded gully, cutting out a long corner and gaining a lot of elevation at the same time. We picked up the road again and began a long traverse through the beautiful Kasnak Forest, a mixture of deciduous broad-leaf and evergreen coniferous trees. 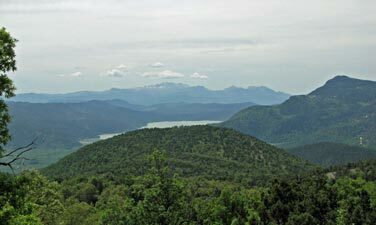 Out to the east, we could look out across the mixed green mosaic of the forest to distant mountains beyond. 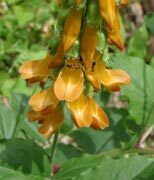 The route led us into the Forestry Park, home to some brilliant wildflowers that lined the roads beneath the canopy of oak, elm, ash, cedar, juniper and many other tree species. Just after the entry to the Park, we reached a fork in the St Paul Trail. The left headed up onto the Davraz Plateau, while the right continued deeper into the forest - we turned right. 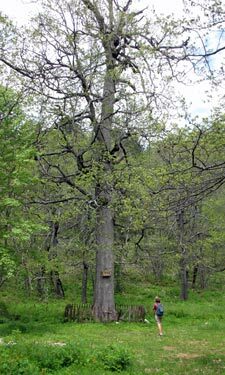 We stopped briefly to admire a 370 year-old, 33.5m tall specimen of volcanic oak before pushing on along a road that meandered and undulated through this very pleasant forest. 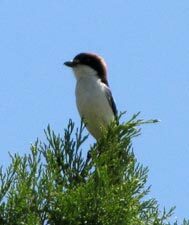 Our surrounds were filled with birdsong and wildflowers, and home to squirrels, the odd ones which scurried across the road ahead or into the rocky outcrops. Some of the deciduous trees were only just bursting back into life. Sunlight poured through their open canopy and the bright green of their new foliage contrasted with the dull greens and greys of the different conifers. The only negative aspect of walking this sun-dappled route was the tiny black flies who took it upon themselves to accompany us - dancing black spots before our eyes – at least they didn’t bite. Passing a clearing in the forest, the route suddenly left the road to follow a tenuous series of half-hidden waymarks on the forest floor, which slowed us down as we hunted out the scraps of red and white paint. We crunched through the dry litter to follow a gully down. 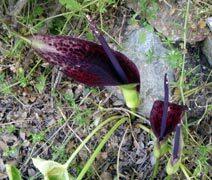 Suddenly it opened out on the edge of an escarpment, overlooking farmland below. It was a good place to eat lunch as there was a slight breeze, which the flies found disagreeable and left, while the tinkling of cow bells drifted up through the forest from below. Lunch over, we scrambled down the slope to pick up a faint and very rocky goat track that traversed gently downwards around the slope to emerge in the cow pastures. 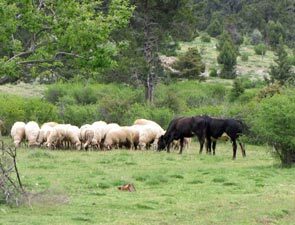 Here a freshly graded dirt road led us alongside the pastures, before taking a long and sweeping upward climb into dense pine forests. 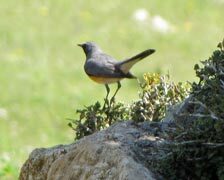 We soon realised that the grading had also removed many waymarkers and, missing a turn-off, found ourselves at the top off the pass overlooking a deep valley, walled in by the scree-covered eastern flank of Davraz Dağ. There being no detailed map and limited guidelines, it was time to put the GPS to the work for which it was designed – getting us back on track. In the un-waymarked forest - so now where? For the next couple of kilometres we navigated from waypoint to waypoint by GPS alone, first retracing our steps to a junction to follow a side road into a large summer pasture, then cutting through a narrow gap. 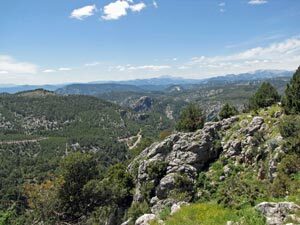 From here, a rocky footpath led us down into the valley we had seen before. 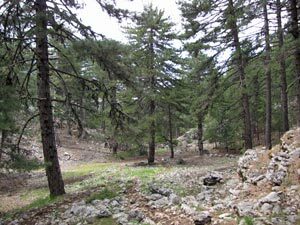 After wandering down unmarked and pathless pine forest gullies, we eventually emerged at a grassy clearing on the valley floor and a shepherd’s camp. It was a great relief to find that the grassy track heading out of the valley had red and white markers once again. Watering point at the goat-herd's camp However, time was getting on and our GPS still indicated a long way to go. Despite the peacefulness and beauty of this valley we pushed on, descending along an orange clay road which curved around and down. Unfortunately, our path didn’t, instead climbing steeply to the high rim of the valley. 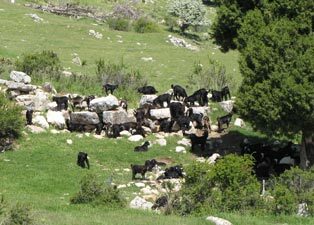 The setting here was superb, a grassy meadow beneath steep scree-covered rock walls, goats bleating and a scattering of goat-herds shelters. 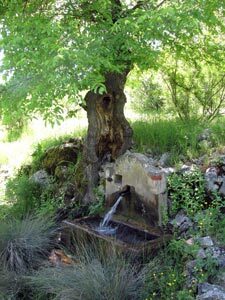 Even better, a spring of cold refreshing mountain water! 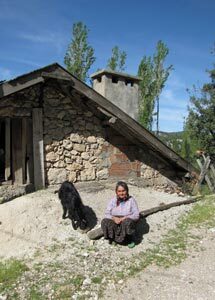 It was the first water source on the track in 6 hours – we drank heartily and filled our bottles. 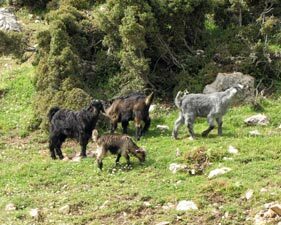 Despite the beauty of their surrounds, the life of a Turkish goat-herd seems a hard one. 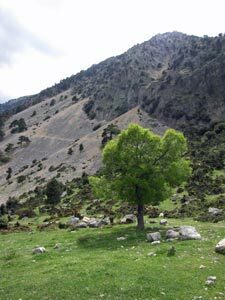 By now, dark clouds were beginning to form over Davraz Dağ in the west, so we pushed on quickly, descending once more into a valley and climbing once more steeply over its far rim on a gravel road. 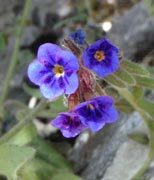 Near the top, the route began to follow a footpath, which took us through the rocky outcrops on a flower-speckled saddle. At last we were on our final descent, chased by darkening clouds and peals of thunder, across open meadows and past distant marble quarries. 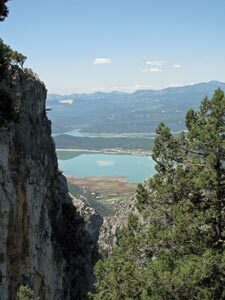 Finally, we crossed a small rise to be greeted by the welcome sight of Lake Eğirdir ahead. 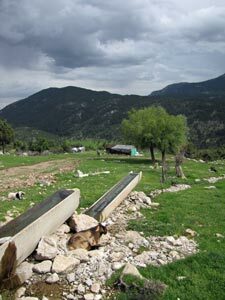 A little further on, we reached a gravel road that took us down to the village of Akpinar. It was now 6pm, we had been walking for 8 hours, and by my calculation it would take another 90 minutes to walk to the town of Eğirdir and our accommodation. With tired feet and the odd rain drops already falling, we didn’t need to discuss the situation. Looking down over the village, the fair Nello had spotted a yellow taxi parked in a street – we quickly headed to it and luckily the driver was sitting in his doorway. Ten minutes later, we were in our comfortable room at Ali’s Pension on Yeşilada at the tip of the narrow spit projecting out into the lake, a hot shower and cold beer soon on the way. We may not have walked into Eğirdir (much of which would have been on sealed roads and in urbanised areas), but we had still enjoyed the serenity of the forest and the grand vistas over the high valleys and farmlands beyond. It was a very different walk to our ones around Sütçüler and complemented them well. 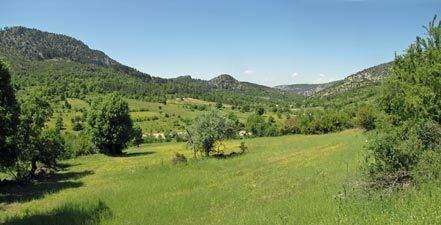 However, unless you are a super-fast walker and don’t want to smell the roses, Akpinar is definitely the place to call it a day. 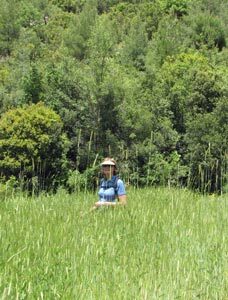 We would also strongly discourage anyone from doing this walk without a GPS – with unmarked sections in deep forest and no features to guide you, without a GPS loaded with waypoints, you might still be wandering through the forests of Pisidia. We had pretty much recovered from the long walk of yesterday after a comfortable night in Ali’s Pension, on the tip of Yesilada, a causeway-linked island jutting out into beautiful Lake Eğirdir. Still, with tired feet, we decided to just do a morning walk and take advantage of this wonderful setting for some relaxation in the afternoon. 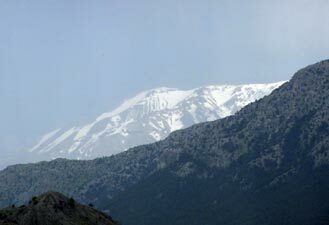 We were off to climb Sivri Dağ – the 1733m mountain which dominates the skyline behind Eğirdir. The thunderstorms that had threatened us yesterday dropped some rain overnight, but the morning was clear and fresh for our short walk. Our host dropped us off at the village of Akpinar, high above the lake, but way below the peak of Sivri Dağ and we set off. Above us to the north the rocky pyramid beckoned. 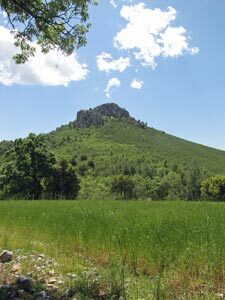 The climb started straight away, at first up a gravel road, then veering off to a side road which slowly degenerated from road to tractor-track to footpath to goat track as it took us up though the lush green meadows above the village. 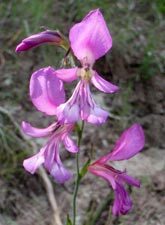 The delicately sweet scent of red clover and distant bleating of goats accompanied us as we passed the shelters of summer goat-herders. 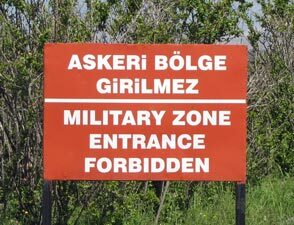 A red sign caught our attention – military zone entrance forbidden – but we had been told about this. Apparently we were on the edge of a large Turkish Army training area, but the route up to Sivri Dağ was supposedly shared territory. A little higher up the slope, just as we were passing the first crumbling ruins of Prostanna, a 2nd century BC stronghold, we met a couple of Turkish soldiers sitting on a rock. “Welcome” said the first. "Don't worry, our guns aren't loaded" said the second, with a mischievous smile. 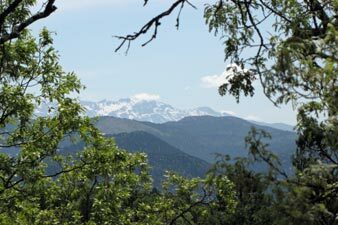 Having been reassured by the two soldiers that there was no problem in continuing our walk, we climbed up through the scattered jumbles of rock that is all that remains of Prostanna to the ridgeline leading to the base of the summit climb. 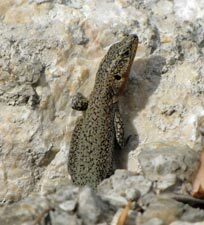 A plastic sniper's dummy leaned nonchalantly against a 2,000 year-old rock wall - I'm sure I saw it wink! Soon we were pushing slowly up the steep and rocky ascent, past the 200, 300, 400 and 500m range markers, prompting a few nervous looks behind. The views above the distant firing platform were opening up to reveal the snow-capped heights of Davraz Dağ, at 2635m the second-highest peak in this region. 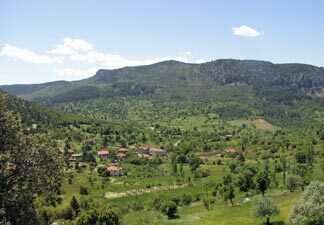 The views also opened up over a column of Turkish soldiers marching rapidly in single file up the track behind us. 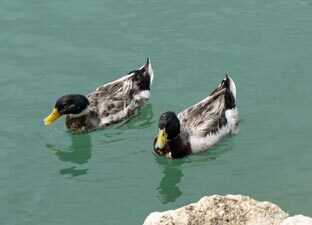 We sat on a rock and waited for them to pass – lots of “merheba”, “hello” and “welcome” put us at ease again. As we were to find out later from their commanding officer, they were a platoon of mountain commandos here for a sniper training course and this climb was part of that course. 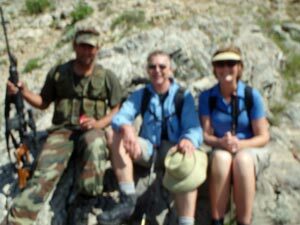 The fair Nello and I fell in behind the last of the platoon, but were soon left in their wake as they pushed up the increasingly steep and rocky track towards a large Turkish flag that marked the summit of Sivri Dağ. 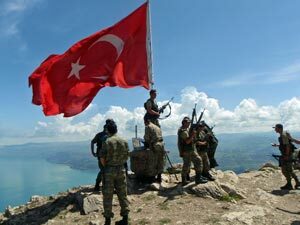 We crested the summit to one of the strangest experiences I have had while walking – a hearty round of applause from the Turkish commandos. This was followed by a rousing antiphonal chant of their oath in front of the red flag of Turkey, its crescent moon and star fluttering in the wind– quite moving, even for an old pacifist like myself. We felt that we were amongst friends and it was sad to see them go - a win for the PR department of the Turkish army. 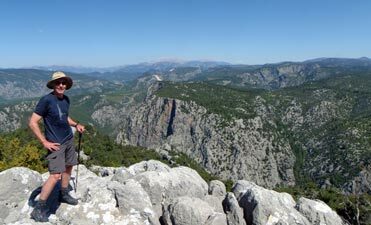 Still, some time alone on this rugged peak with its 360° panoramic views of distant mountains and beautiful Lake Eğirdir was appreciated. Commando! .... Commando! .... Commando! We followed the same route down - past the plastic dummies hiding in different places and the signs marking 200, 300, 400, 500m. 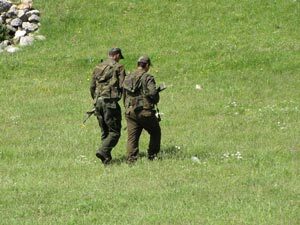 Despite the exceptional friendliness of the soldiers it was still a little disconcerting walking through a sniper training ground. 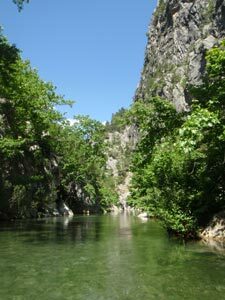 We reached Akpinar in time for lunch – pancakes and Turkish coffee under a gazebo on the edge of the escarpment, overlooking the mountain we had just climbed and the green waters of Lake Eğirdir fading into the distance. It was the perfect spot to end our adventures on the St Paul Trail. By the time that we arrived back at our hostel at Yeşilada, the clouds had moved in to cast a grey pall over the surrounding mountains, yet the lake weaved its magic, dispersing them as they drifted over and, here, at the end of this long spit of land, it still shone brilliantly. The afternoon was ours to soak it up, relax and reminisce about the great time we had wandering in the footsteps of St Paul.